The award winning KORG Gadget music production iOS app is soon to be released for the Mac. Building on the smooth operability and intuitive user interface of the iOS version, "KORG Gadget for Mac” provides a new dimension of inspiration for every creative artist. The Mac version also comes with "Gadget Plug-In Collection," a magnificent collection of plug-ins that support AU, VST, AAX, and NKS. 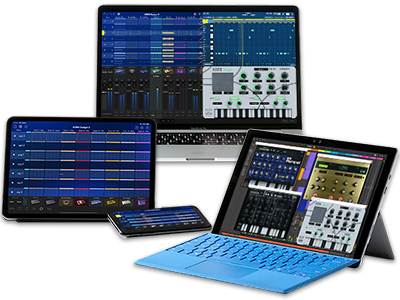 With KORG Gadget, you can use the Mac version at home and the iOS version when you are mobile, letting you enjoy a seamless workflow and ideal music production experience. The care that KORG has paid to hardware instruments over more than 50 years of experience has been channeled into the powerful cutting-edge musical software that is KORG Gadget. Now, the ultimate all-in-one music production studio extends its scope to a new platform and brings a new level of music making for Mac users everywhere. * Comes with "Gadget Plug-in Collection," a magnificent collection of plug-ins that support AU, VST, AAX, and NKS. All information will be publicly announced when the NAMM show opens on January 19, 2017 (local time) in Anaheim, California, USA. Don't forget to check the KORG Gadget product page. Home News From iOS to Mac. KORG Gadget, the all-in-one music production software, appears for Mac soon.